Nike can claim to "change football boots forever" all it wants; the debut of its new "Magista" cleat still created more whimper than bang. The announcement followed on the literal heels, after all, of Adidas's "Samba Primeknit," which, by virtue of its auspicious timing, now lays claim to the title of "world's first knitted football boot." Like the Samba, the Magista is designed to allow the foot to push up closer to the ball, allowing improved traction and control. “Our aim at Nike has always been to meet the athlete’s particular performance demands and amplify his unique set of skills," Mark Parker, CEO and president of Nike, says in a statement. 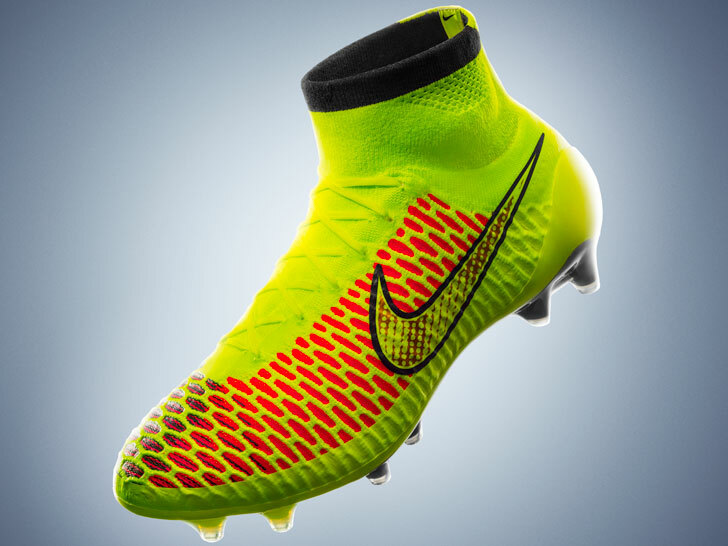 "Magista inherits that transformative history of design and innovation and supercharges it." The shoe also marks the first time Nike engineered its virtually seamless “Flyknit” technology for football. Four years in the making, the Magista takes into account feedback from some of the world’s leading attacking playmakers, including Barcelona’s Andrés Iniesta and German forward Mario Gotze. Nike’s Flyknit technology reduces waste by an average of 80 percent. Flyknit, according to Nike, defies conventional shoe manufacturing by creating an engineered upper woven from special yarns. First used in Nike running shoes in 2012, it creates a second-skin, almost sock-like feel. Another plus? The process reduces waste by an average of 80 percent compared with a typical Nike shoe. The Magista features a three-dimensionally knit textured upper with a more “aggressive” texture for increased traction. The boot is also water- and cold-resistant. To protect the foot from less-optimal environments, Nike’s designers added a 0.1-millimeter sheet of “NikeSkin,” a breathable mesh bound within a polyurethane film, by melting it on top. The shoe also marks the first time Nike engineered its virtually seamless "Flyknit" technology for football. Four years in the making, the Magista takes into account feedback from some of the world's leading attacking playmakers, including Barcelona’s Andrés Iniesta and German forward Mario Gotze. Flyknit, according to Nike, defies conventional shoe manufacturing by creating an engineered upper woven from special yarns. First used in Nike running shoes in 2012, it creates a second-skin, almost sock-like feel. Another plus? The process reduces waste by an average of 80 percent compared with a typical Nike shoe.